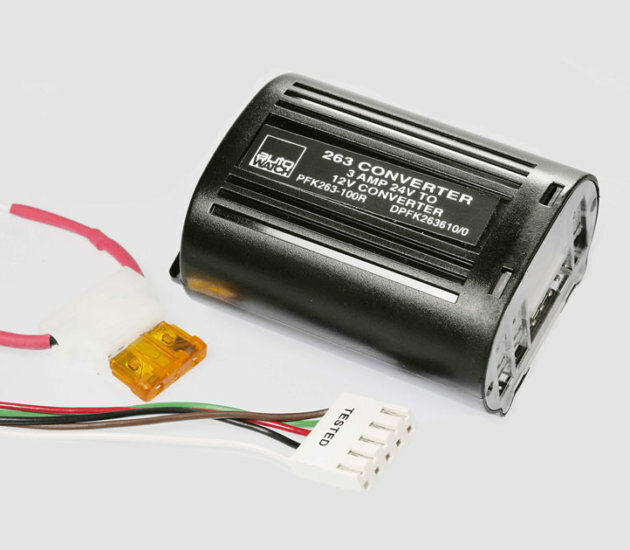 24 volt to 12 volt converter for the fitment of 12 volt alarms or accessories to a 24 volt vehicle. Module also supplies an ignition switched 12 volt output for items that require a switched 12 volt supply, rated at 3 amps. The module can supply a constant +12VDC at 250mA need when a system is disarmed and immobilisation relays are energised. The module can also supply the much higher current need to sound the siren for the 30 seconds (as allowed by sound output regulatory bodies). The module is not able to supply the +10 amps required to power central locking systems. A much higher capacity converter is required. Please call Dynamco direct on 08 9221 2345 or email the helpdesk with your enquiry. Complete installation guide and specifications for the CONVERTER.